Welcome Dear Readers to this week’s edition of Gregory’s Bible Stories. 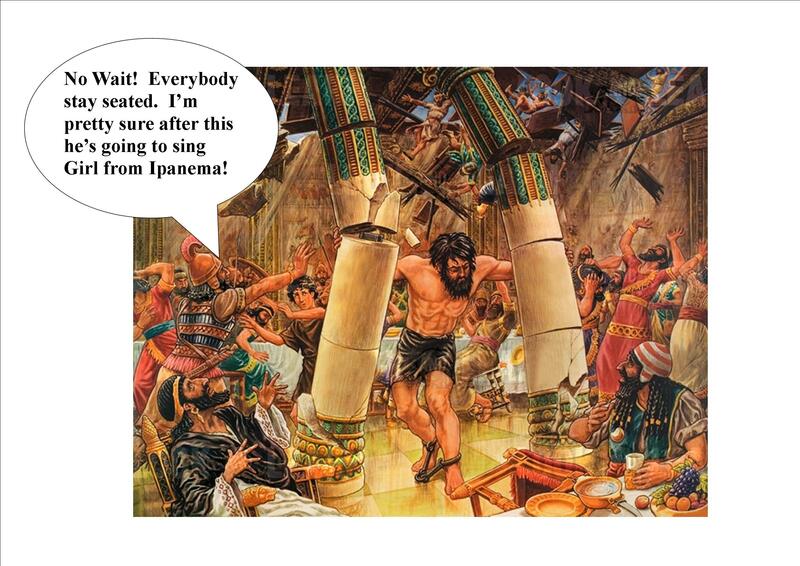 Today Gregory learned about how Samson entertained the Philistines. Let’s listen in as Gregory tells us how it all happened. “Our god has given us victory over our enemy Samson.” Nobody knows for sure what the tune was — but judging from the lyrics, it probably wasn’t very catchy. King A to King B: This party’s getting kind of dull, don’t you think? King B to King C: Nothin’. King D: I wonder what we could do to liven it up? King E to King D: Well, if we had some Christians we could feed them to some lions if we had some lions. King A to no king in particular: Oh I know! Let’s let Samson out of prison to entertain us. King #228: You mean, Samson, the strongest man who ever lived, who is at this very moment locked up in the basement with the recently shorn hair and the even more recently poked out eyes? King B: Excuse me King #228, but I think you wandered into the wrong group of kings. Where did you come from? King #228: 1 Kings 19? King C: Hahahahaha! I knew it! Well anyways, I’m going out for more fig wine. . . wait a minute, I can’t find my chariot reins! King B: I took them. King B to King C: Because Kings don’t let Kings chariot drunk. King A to King B: I’m about ready to fall asleep. You want I should go get Samson out of his cell? King B to the only King left who was paying any attention at all (King #228): No let’s send a dumb little boy to take Samson by the hand, and lead Samson, the strongest man who ever lived, out to us and have him stand between those two pillars over there. King C to King B: You mean those two pillars over there that are purely decorative and are not structurally needed should they somehow be destroyed or do you mean the two load-bearing pillars that if something were to happen to them the entire palace would collapse and everyone would be killed including Kings A through #228? King B: The latter . . No wait . . . the former? While King B was looking up the definitions of former and latter, the dumb little boy led Samson to the two load-bearing pillars and Samson took hold of them and pushed with all his might. The entire building fell down killing all 3,000 party-goers and every single one of the kings except for King #228 who quickly high-tailed it back to 1 Kings 19. And there you have it, Dear Readers! What Gregory learned in Sunday school today. Please check back next week at the same time to find out what Gregory comes up with. And that concludes this week’s edition of Gregory’s Bible Stories. Please check back next week for more biblical adventures as told by Gregory. Welcome Dear Readers to this Sunday’s edition of The Bible According to Gregory. 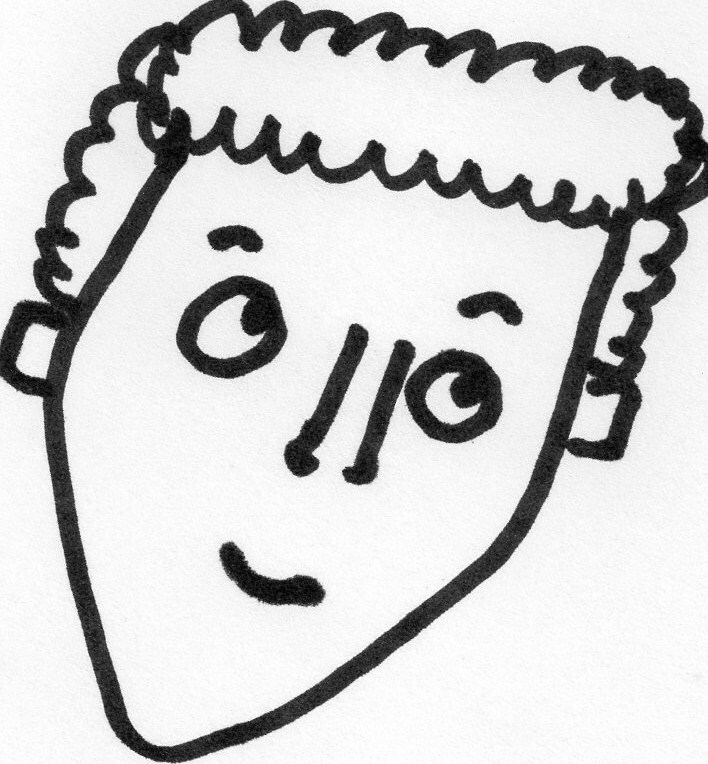 Gregory goes to Sunday School Every week, but Gregory never listens and comes home with his own version of the story. Let’s listen in and see what Gregory learned in Sunday School this week shall we? 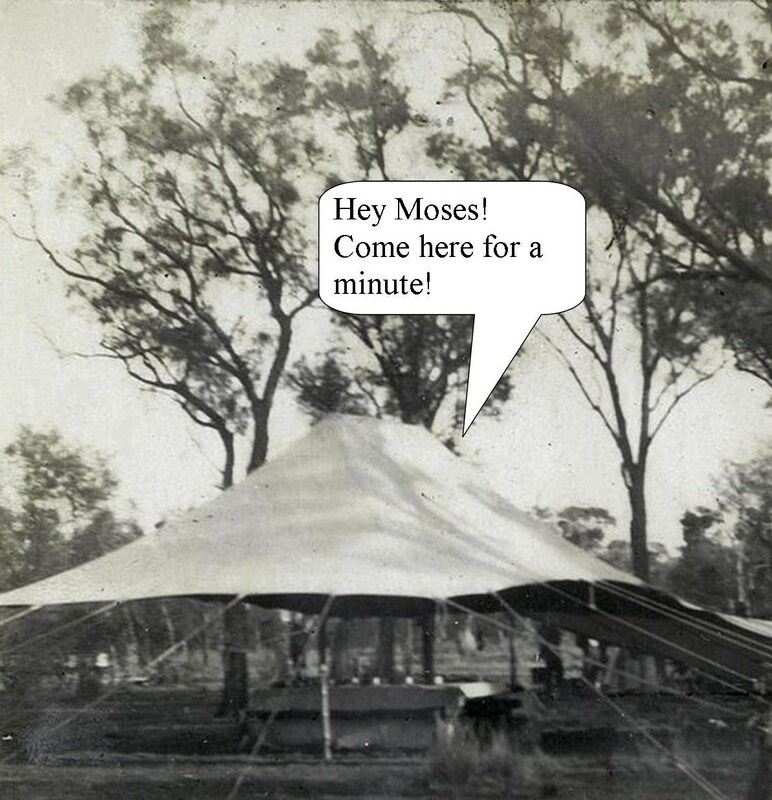 One day, while Moses was walking by the tent belonging to the Lord, he heard God calling out to him. And there you have it, Dear Readers, this week’s edition of The Bible According to Gregory. Please check back next week at this time to see what Gregory learned in Sunday school. Welcome Dear Readers to this Sunday’s edition of the Bible According to Gregory. Let’s listen in and see what Gregory learned in Sunday school this morning, shall we? Job was a biblical character who lived in the holy land of Uz believed by scholars to have been located somewhere over the rainbow — providing there had ever been enough moisture in the holy land to produce a rainbow. Job was always extremely careful when it came to not sinning against the Lord. The Lord: Did everybody get their handouts on Sacrificing Do’s and Don’t’s and does anybody have any questions? Yes, the heavenly being with the horns and the name tag that says Santa. What’s you question, Santa? 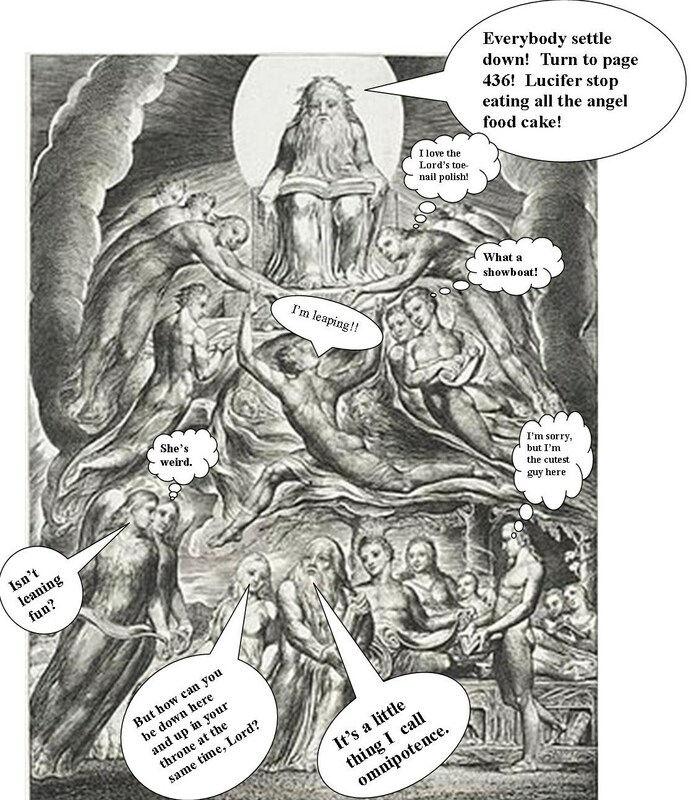 Satan: Yeah, my name’s not Santa, by the way, it’s Satan, that’s a typo I caused to happen. Bwahaha! The Lord: I don’t get it, what do you mean by typo? Satan: It’s a . . . oh never mind. The Lord: So what have you been up to, Satan? Satan: Oh you know, walking here and there, roaming around the earth and holding Idle Hands Workshops for the aristocrats, the usual. The Lord: Well that’s just super! Say, did you happen to notice my servant, Job, he’s like the best worshiper I’ve ever had! He never does anything evil! Satan: Yeah, that’s because he’s got 7,000 sheep, 3,000 camels, 1,000 head of cattle, 500 donkeys and lord only knows how many cats. The Lord: That’s not true. I have no idea how many cats he has. Satan: Bwahaha! There you go again with your sense of humor! The Lord: My sense of what? Satan: Never mind. Say, I’m just wondering . . . what about testing Job to see if he would still be such a Goodie-Two-Shoes if his life suddenly became a living hell. I could help you out with that. The Lord: Well . . . . . The Lord: Well I guess, but only if you promise not to hurt Job. You know how hard it is nowadays to find a good Job. Satan: Bwahaha! You crack me up! The Lord: Am I to understand that is your awkwardly worded request stating your desire to be cracked up? Satan: Say will you look at that! It’s half-past eternity already. Where does the time go? I gotta skedaddle. See ya around, Lord. Servant: We were plowing the fields and got attacked! All your donkeys were stolen and all your servants were killed! Job: But they didn’t kill you? Servant: Yeah . . . (still huffing and puffing) . . . except for me. Job: Oh great you’re the only slave I have left? And you’re not even in that good of shape. Then another servant came running up to Job, huffing and puffing. Servant: Lightening just struck all the sheep and shepherds and everyone was killed but me. Job: Hmm . . . I’m starting to sense a pattern here. Just then another servant came running up to Job, huffing and puffing. Servant: Your children were having a feast at the home of your oldest son when a storm swept in and blew the house down and killed them all. Job: Except for you . .
Servant: Yeah, how’d you know? After that Job tore his clothes in grief and shaved his head which was the standard biblical procedure when someone a) broke a new pottery water-carrying vessel b) misplaced their dreidel or c) had all their children and animals slaughtered by Satan. This is about the time the Lord turned on his Heavenly Conference Room hidden earth video camera and observed Job when he said, “I was born with nothing and I will die with nothing. The Lord gave, and now he has taken away. May His name be praised! 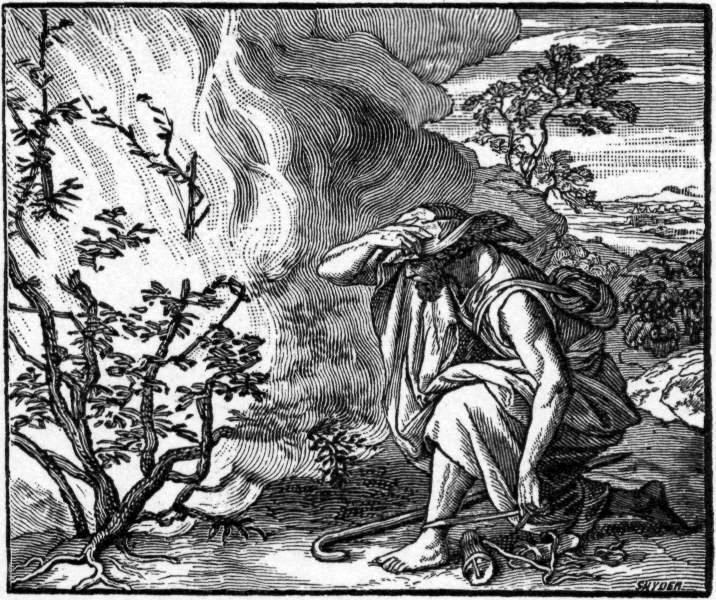 In spite of everything that had happened, Job did not sin by blaming The Lord. It’s a good thing too since Job had nothing left to kill. And there you have it, Dear Readers, what Gregory learned in Sunday school this week, come back next week at this same to so see what new bible lesson Gregory learned about! 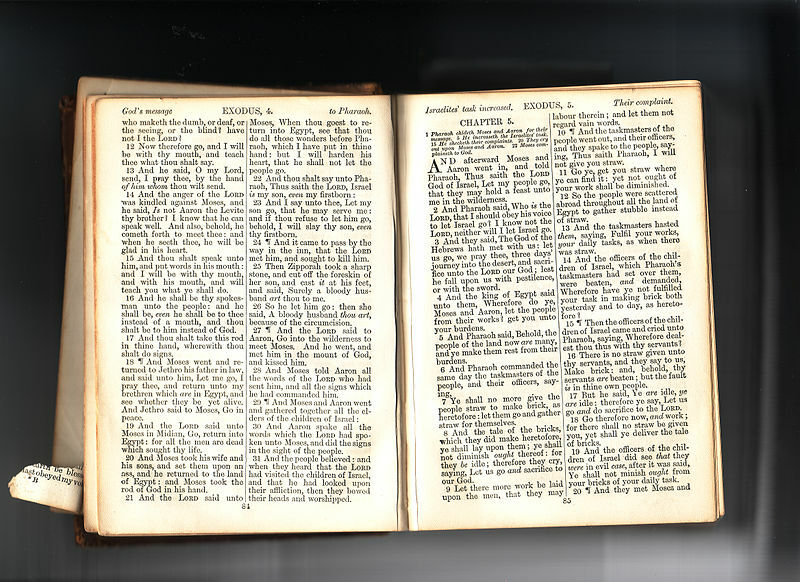 “Welcome Dear Readers to this Sunday’s edition of Gregory’s Bible Stories. Every week, Gregory goes to Sunday school. Every week his imagination runs wild during the lessons, and every week he comes home with his own version of the story. After the ascension of Jesus everybody was waiting for the Holy Spirit to come upon them which Jesus said was going to happen just before he ascended to heaven on a cloud. The apostles had tried to pin Jesus down to a time line so they’d know when to clear their calendars, but Jesus was never very forthcoming when it came to exact dates. Then one day, all the apostles and various believers from all over the biblical world were gathered together for the Jewish festival of Shavout, to commemorate when God gave Moses the Ten commandments which was celebrated by a lot of yelling and shavouting. But then one Shavout, the Holy Spirit came to visit. Everyone was sitting around resting their vocal chords when suddenly there was a noise from the sky that sounded like a strong wind blowing, and it filled the whole house. But instead of a strong wind, it turned out to be the tongues of fire of the Holy Spirit, which proceeded to touch every person there so that they were filled with the Holy Spirit which enabled them to suddenly speak in another language so that the people from the country of the other language they were speaking could understand every word they said — even though the person listening from the other country knew darn good and well that the person suddenly speaking their language didn’t even know how to ask, “where the restroom?” five minutes earlier! But then others started making fun of the believers saying they were drunk. Finally Peter couldn’t take it any more, he stood up and took the microphone (hand cranked). Then a man from Nazareth raised his hand. Peter: Yes, you, random Nazarene guy, you had a question? Random Nazarene guy: Yes, I was just wondering if you knew what time the people would be drunk, approximately. 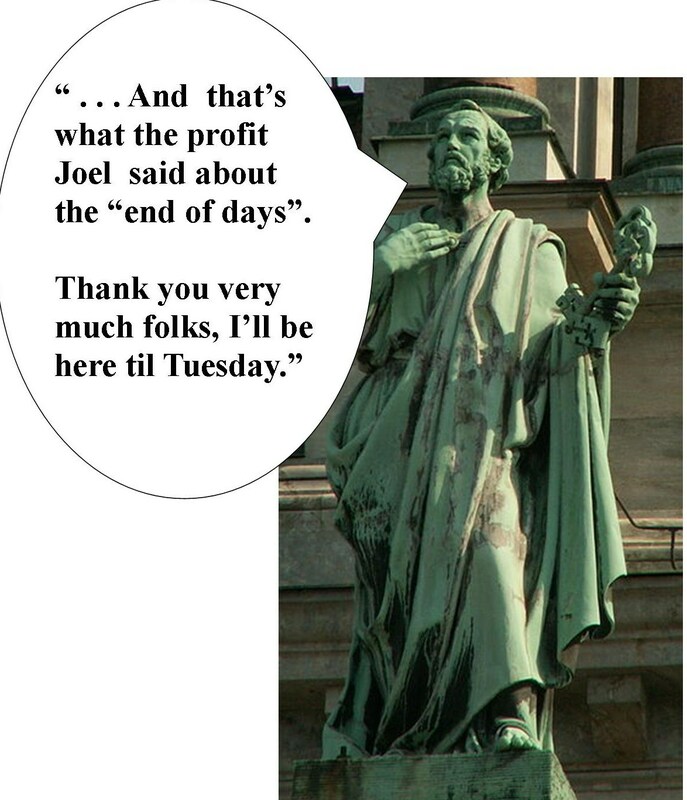 Then Peter tried to get everybody’s mind off drinking by reminding them what the prophet Joel said concerning “the last days” — being sure to include some good news — that everyone will be filled with the holy spirit — and glossing over the bad news about the sun being darkened and the moon turning red as blood and whatnot. Then Peter ended his talk on a good note by telling them that when the last days came all anyone had to do was call out to the Lord, and they would be saved. Finally, Peter wrapped his speech up by saying, “Save yourselves from the punishment coming on this wicked people!” Which wasn’t really grammatically correct but Peter had been talking nonstop for so long he just didn’t care anymore and handed his microphone back to the random Nazarene guy. But then, when Peter saw 3,000 lining up to get baptized, Peter took the microphone again and everyone got glum again. 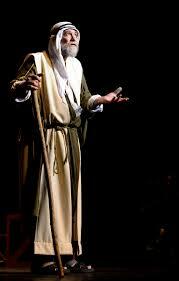 That is until Peter launched into the very best rendition of Twist and Shavout this side of the River Jordan! And they worked it on out. 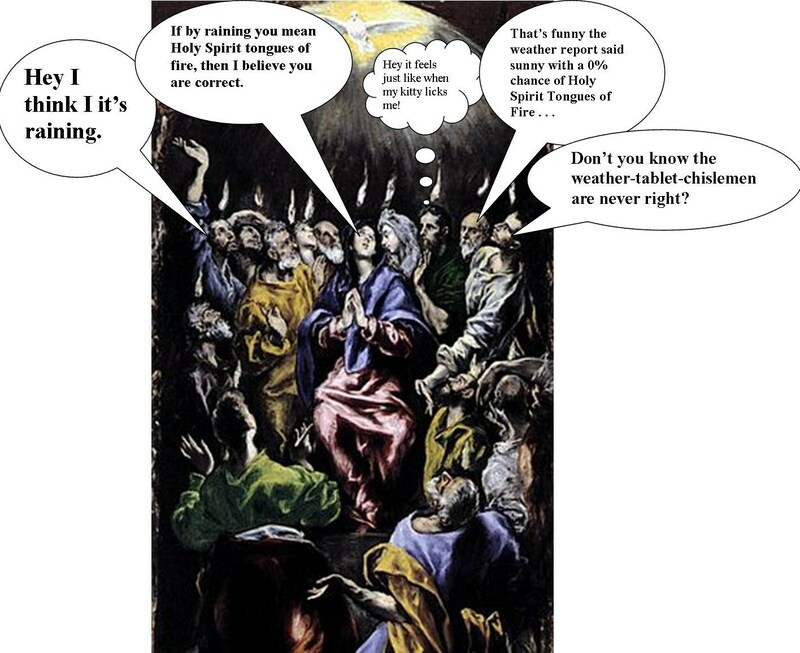 And there you have it, Dear Readers, this week’s edition of Gregory’s Bible Stories. Please stop by next week to see what Gregory learns in Sunday School. Let’s listen in and see what the lesson was about this week, shall we? When last we left Noah, God was explaining to Noah about how wicked everyone on earth was and how evil their thoughts were and that He was sorry He had ever made them. Noah: Don’t be discouraged about how mankind turned out, Lord. You’ve got to remember it was your first try at making large amounts of people. God: I’m full of regret, Noah. Everyone on earth is thinking evil thoughts all the time. Noah: Well maybe if you didn’t listen in on their thoughts so much. Maybe you just need a vacation from everybody’s thoughts. God: See that’s what I like about you Noah, you’re upbeat! You don’t have any faults! You’re the only good man of your time. Noah: Ah shucks, God, you’re embarrassing me. God: No, I mean that. Out of all of mankind, I only like you. You’re my best friend! Mankind is like a way, way distant second compared to you, Noah. You’re the only good man I ever created. In fact, come here, I want to give you a big hug. God: Come on! I won’t bite! I may wipe you out in a flood, but I won’t bite! Noah: God you made a joke! God: I did? Well you bring out the best in me, Noah. Say, you wouldn’t happen to have anymore of that pomegranate wine cooler on hand would you? Noah: Sure do you want one? God: Does a bear sit in the woods? Noah: Ah ha ha! You made another joke, Lord! God: I don’t get it. What’s the joke? Noah: Well, you know, because a bear doesn’t sit in the woods it— uh . . . hey, you want that wine cooler in a goblet, God, or do you want to drink it right out of the pottery vessel? God: Just give me the vessel. Anyway, like I was saying, Noah. I have decided to put an end to all of mankind. I will destroy them completely because the world is full of their violent deeds. Mm . . .great wine cooler Do you have any Pringles? Noah: Yes but they’re a little stale. The expiration date was 500 years ago. I borrowed them from Grandpa Methusula. God: Is he still alive? Awesome! Noah: He’s 969, but could pass for a 700, I kid you not! God: Super! Anyway, getting back to the flood I’m sending to wipe out every living thing on earth except for you and your family; I took the liberty of drawing up some plans so you can build a boat. Noah: But Lord! I can’t even figure out how to put together a bookshelf. God: Oy pshaw Noah! All you have to do is make a boat with some rooms in it, cover it with tar inside and out, make it 450 feet long, 75 feet wide and 45 feet high, make a roof with a space of 18 inches between the roof and the sides. Then simply construct three decks and slap a door on the side. It’s just you’re basic biblical boat. No big whoop. Don’t over-think it. “My boat building skills are kind of iffy, Lord. On a scale of one to ten, how do you feel about rafts? Noah: But Lord, when it comes to carpentry I’m all thumbs. God: You’re kidding me. Where were you when I was passing out fingers? Noah: I was . . . no Lord. It’s just an expression. God: Listen, Noah, why don’t you get your three sons to help you out with building the boat. What are their names again? Moe, Curly and Shemp? Noah: But, Lord, my oldest son is only a hundred. He’s still in that toddler stage. Noah: No no no no no no no! Lord! I was just kidding! I can build a boat. Absolutely! Positively! Not a problem at all. I’ll get ‘er done! God: I’m so relieved to hear you say that Noah. Because building that boat? God: Well that’s the easy part. Wait til you hear what I’ve got in mind for step two . . .
And there you have it, Dear Readers. This week’s edition of what Gregory surmised in Sunday School this morning. Please check back next week to learn about Step two of God’s plan for Noah. When Jesus was alive, he had to walk everywhere. Biblical walking wasn’t much fun. Everybody wore opened-toed shoes with no arch support, and there was ox manure everywhere and people were constantly stubbing their toes on the stones that were laying around all over the place– which made the countryside convenient for impromptu stonings, sure, but horrible for walking. One day on his way to Galilee, Jesus and his disciples got a little lost and realized they would have to walk through Samaria. In those days, Samaria was to Jesus and his disciples what Mexico is to Americans today. Fun but iffy. After stepping in ox manure and stubbing their toes on rocks all the way there (except for Jesus who not only knew exactly where, but, more importantly, where not to step), the disciples and Jesus were pretty tuckered out. Finally they came to a well and Jesus sat down to rest while the disciples, who were starving, went to find a good goat burger drive walk-through. A Samaritan woman came to draw water from the well that Jesus was sitting on. Samaritan Woman: Uh, excuse me. Can you move over, I’m trying to draw some water. Jesus: Will you give me a drink of water? Samaritan Woman: Well uh . . . I see by your name tag that you’re a Jew and I’m a Samaritan and Jews never drink out of Samaritan cups! 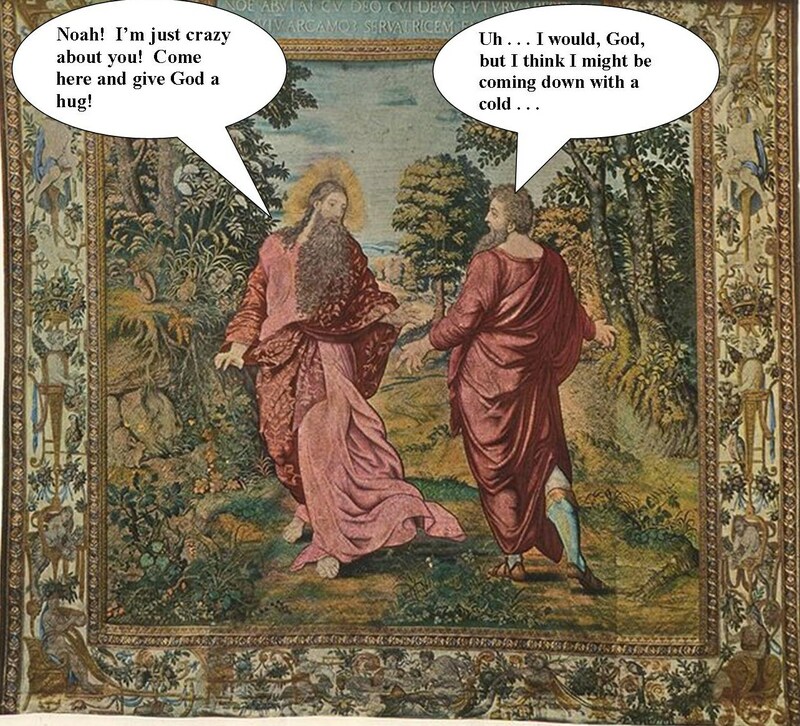 Jesus: Actually, I could give you some water. Some living water and then you would never be thirsty again. Indeed the water I give will become a spring of water welling up to eternal life. 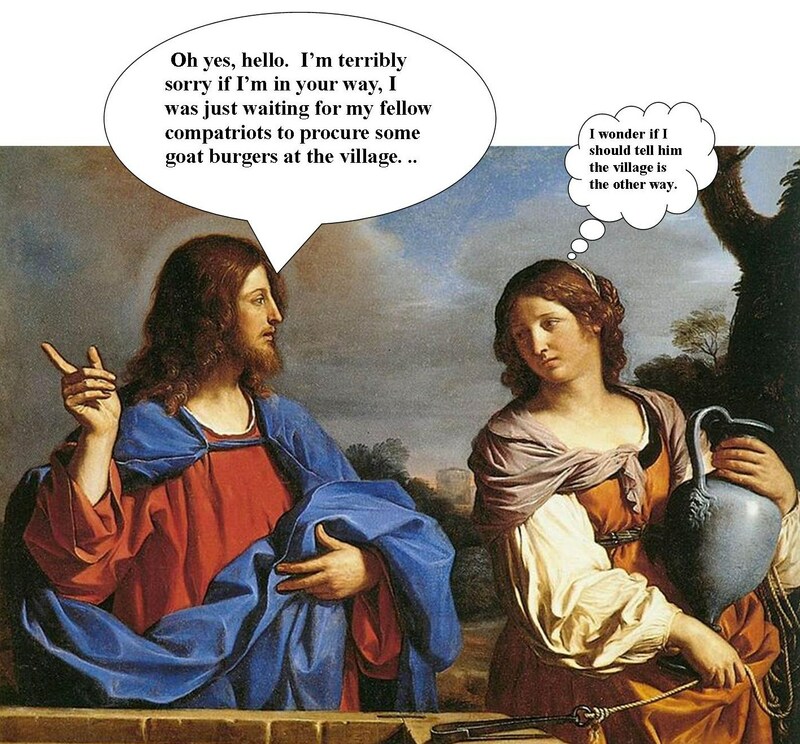 Samaritan Woman: No kidding? Kind of like a camel only better! Jesus: Go get your husband. Samaritan Woman: I have no husband. Jesus: You are right when you say you have no husband. The fact is, you have had five husbands and the man you now have is not your husband. What you just said is true. Samaritan Woman: So you’re the one whose been reading my diary! Then Jesus told the woman the time is coming when true worshipers will worship the Father in spirit and in truth. Samaritan Woman: Well I know that Messiah is coming. When he comes he will explain everything to us. Just then the disciples showed up with some righteous goat burgers and the woman left her water jug and ran back to the village to tell the Village People (who just happened to be playing there that day) as well as the rest of the village people that they were never going to believe who she just met at the well . . . 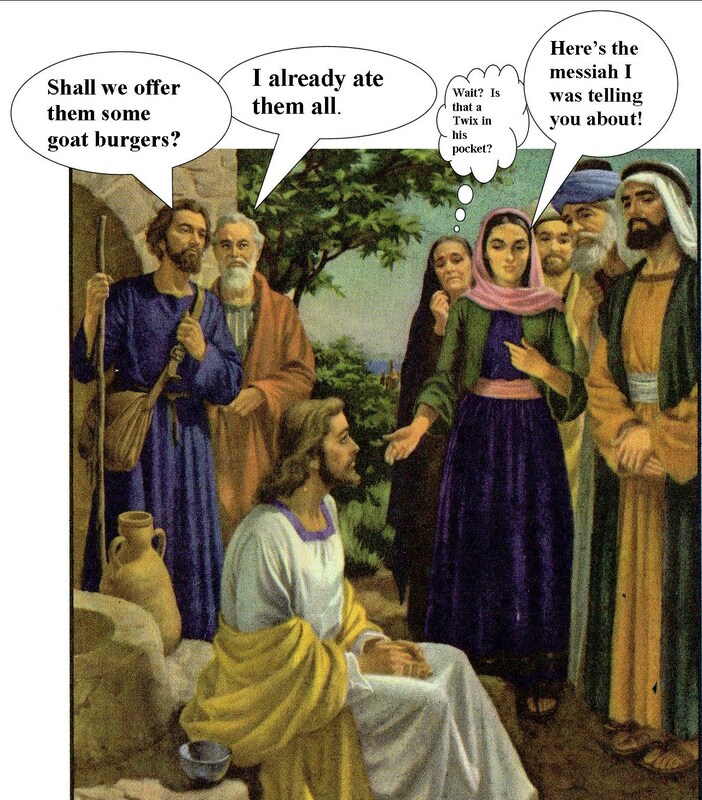 Meanwhile the disciples were trying to get Jesus to eat. If the disciples were disappointed, they tried not to show it. And there you have it, Dear Readers, what Gregory learned in Sunday School this morning. Please check back next week, to see what Gregory new exciting things Gregory will learn in Sunday School. After Easter, Jesus appeared to his disciples 40 times. Nobody knows whether Jesus came to visit them once a day for 40 days, or once every other day for 80 days or twice a day for 20 days. Biblical Scholars have tried to work it out mathematically, but have never been able to come up with the right answer which explains why they majored in theology in college and not math. This cheered the apostles up considerably because not only were they looking forward to the holy spirit coming upon them; it also meant they were going to have jobs that included travel. After telling the apostles this, Jesus was taken up to heaven while the apostles watched Him even though a cloud was hiding Jesus from their sight. Biblical scholars are uncertain as to whether this cloud was intentional or if it was just the most ill-timed rain cloud in the history of mankind. If the Apostles responded by saying — “Why would that make us not want to watch while Jesus ascends to heaven?” the bible isn’t letting us in on it. Once they got back to Jerusalem, the apostles went up to the room where they were staying and all the apostles were there except for guess who? Judas and the guy who was suppose to deliver the fig pizza. Everybody knew why Judas wasn’t there. After betraying Jesus, Judas had gained an enormous amount of weight and eventually went into a field and died from choking on a ham sandwich after which he burst open and all his insides spilled out — grossing out everyone and their goat — even including the lepers who were totally used to being grossed out. 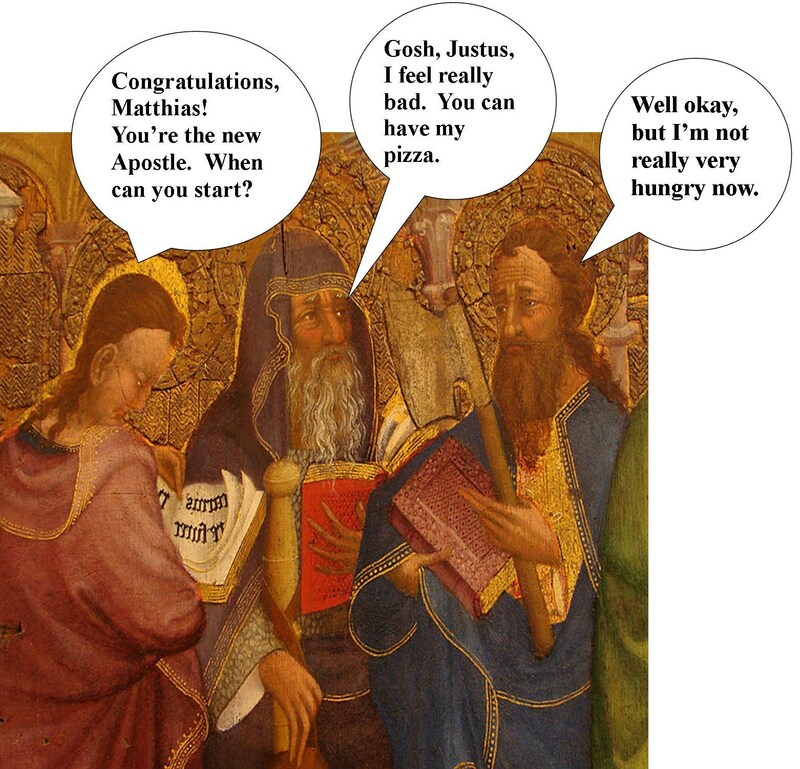 Anyway, after praying about who should replace Judas, two clear choices emerged: Justus and Matthias. After praying some more, choosing lots, rolling dice and using the Roman Applause Meter (hand cranked), it was determined that Matthias won by a clap. Right about then the fig pizza guy finally showed up. Everybody felt bad for the loser, Justus, so they let him help himself to the pizza first. And thus Justus was served. And there you have it, Dear Readers, this week’s edition of The Bible According to Gregory. Please stop by next week to see what Gregory learns in Sunday school.